Chicha a term used in some regions of Latin America for several varieties of fermented beverages, particularly those derived from maize, but which also describes similar non-alcoholic beverages. Chicha may also be made from manioc root (also called yuca or cassava), or fruits, and other ingredients. Left: A glass of homebrewed chicha de jora from Peru. It is traditionally prepared from a specific kind of yellow maize (jora) and is usually referred to as chicha de jora. It has a pale straw color, a slightly milky appearance, and a slightly sour aftertaste, reminiscent of hard apple cider. It is drunk either young and sweet or mature and strong. It contains a slight amount of alcohol, 1-3%. Chicha morada is not fermented. It is usually made of ears of purple maize (choclo morado) which are boiled with pineapple rind, cinnamon, and clove. This gives a strong purple-colored liquid which is then mixed with sugar and lemon. Chicha morada is known as api in Bolivia and is generally drunk as an accompaniment to empanadas. While chicha is most commonly associated with maize, the word is used in the Andes for almost any homemade fermented drink, and many different grains or fruits are used to make "chicha" in different regions. 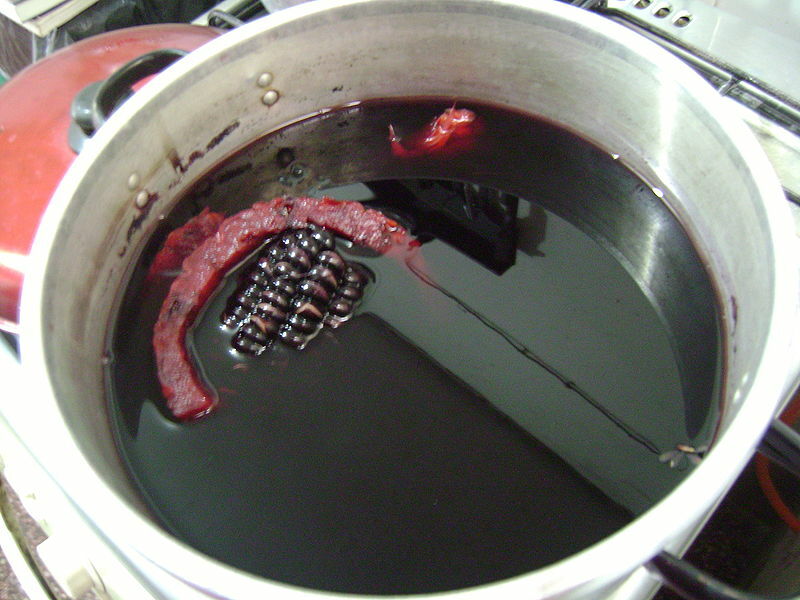 Left: Chicha morada peruvian style, boiled in a pot with pineaple and purple corn. 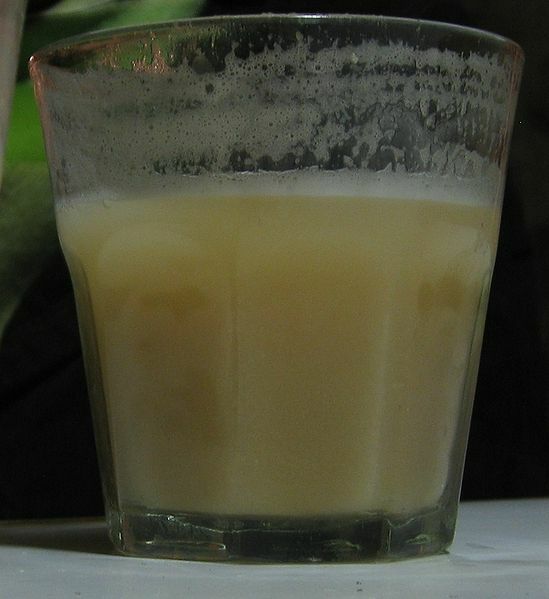 Chicha de jora has been prepared and consumed in communities throughout in the Andes for millennia. The Inca used chicha for ritual purposes and consumed it in vast quantities during religious festivals. Chicha de jora is prepared by germinating maize, extracting the malt sugars, boiling the wort, and fermenting it in large vessels, traditionally huge earthenware vats, for several days. The process is essentially the same as the process for the production of beer.